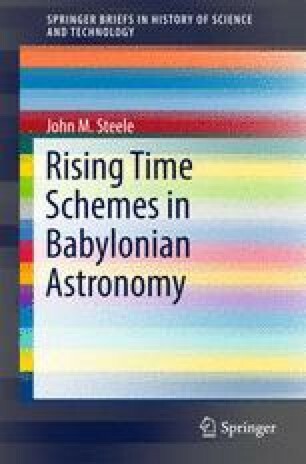 This chapter studies several texts which are related to the rising time schemes in order to place those schemes in a broader context. Using the fully reconstructed rising time scheme it has been possible to better understand the content of these texts. In particular, the so-called ‘GU Text’ is shown to include references to the rising time scheme. Since the GU Text is probably to be dated to before the development of the zodiac, the link between it and the rising time scheme confirms the priority of the calendar-based form of the scheme over the zodiac-based form, and pushes the development of the rising time scheme significantly earlier than previously assumed.